Liberty Mutual's greed is doing immeasurable harm across America to policyholders and accident victims like Cheryl Harris. The website JusticeforCherylHarris.org is full of damaging information about the company. It's also about Cheryl Harris, who as a young woman left for dead, survived and led police to a serial killer thus saving countless lives of other women. 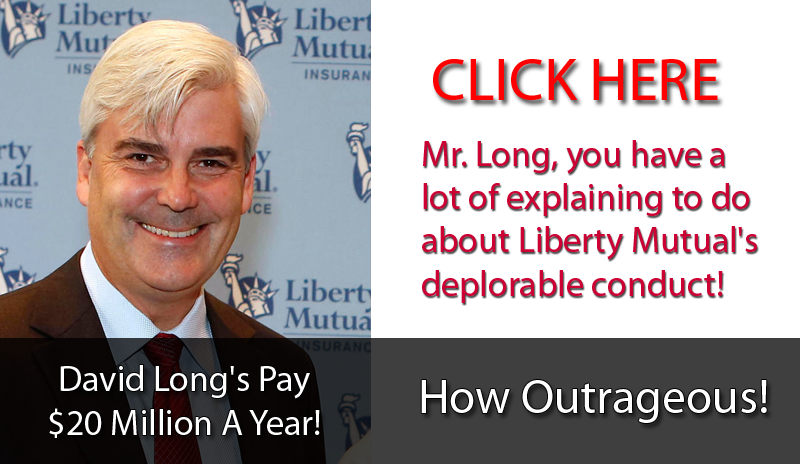 While helping Cheryl, we hope to help others victimized by Liberty Mutual and to hold its $20 million a year CEO David Long accountable as well. Anyone concerned about Liberty Mutual's contempt for its policyholders and accident victims, may download and print the leaflet below and contact us on how to obtain the 4 x 8 foot accompanying banner to use in protests at Liberty Mutual locations across the country. 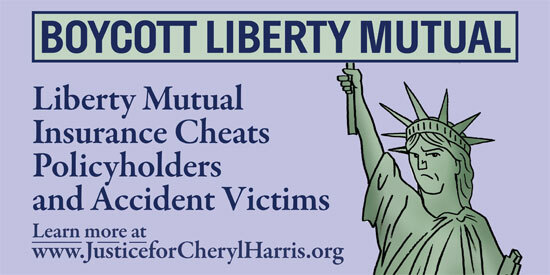 I/my organization is circulating the leaflet "Liberty Mutual Insurance Cheats Policyholders and Accident Victims" available from the website, JusticeforCherylHarris.org. 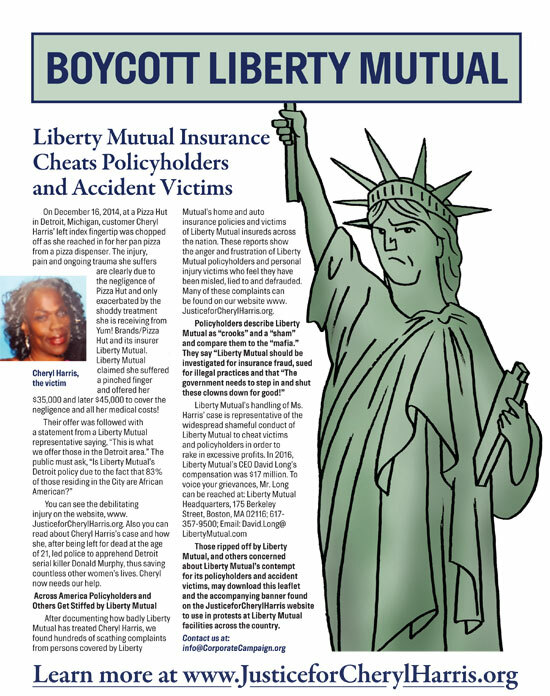 The leaflet states: "Policyholders describe Liberty Mutual as 'crooks' and a 'sham' and compare them to the 'mafia.' They say 'Liberty Mutual should be investigated for insurance fraud, sued for illegal practices and that 'The government needs to step in and shut these clowns down for good!" You and Liberty Mutual need to clean up your act fast! Mr. Long, what do you plan to do? © 2018 Corporate Campaign, Inc.